Anjula Prasad was raised in a very devotional family that revered Indian classical music as one of the highest forms of spirituality. While growing up, she frequently traveled throughout India, where she learned to chant and discovered how fulfilling it was to express her devotion through her own voice. In 2007, she recorded her first album, Anjula, a collection of traditional chants sweetly sung over powerful sounds of guitar, tabla, and dholak. The recording captures the heightened energy of Anjula's kirtans, where the simple, yet intense repetition of mantras creates an open space to go within. In 2013 Anjula began recording her latest album, set for release in 2014. Devadas is a devotee and a singer/songwriter based in Brooklyn. He began making music as a teenager in his hometown of Portland, ME. After moving to NYC in the early 90′s, he became interested in eastern spirituality, and met his Guru, Mata Amritanandamayi Devi. Under Her inspiration, he began the regular practice of bhajan, traditional Hindu call and response devotional singing, leading kirtans all over New York, the East Coast and India. He has recorded a wide variety of CDs and in 2012, collaborated with J Mascis, to produce and record the film score for the feature documentary, One Track Heart: The Story of Krishna Das. In 2013, he produced Nina Rao's chant album, Antarayaami, and released a double album of his own, Brooklyn Mellows. His latest album, Radio Nada, is an brilliant juxtaposition of ancient mantra and modern lyricism, mixing guitars, electronics, tablas, harmonium and much more, for a refreshing soundscape kirtan album. Jeremy Frindel has been making music for most of his life, and chanting is an integral part of his personal practice. 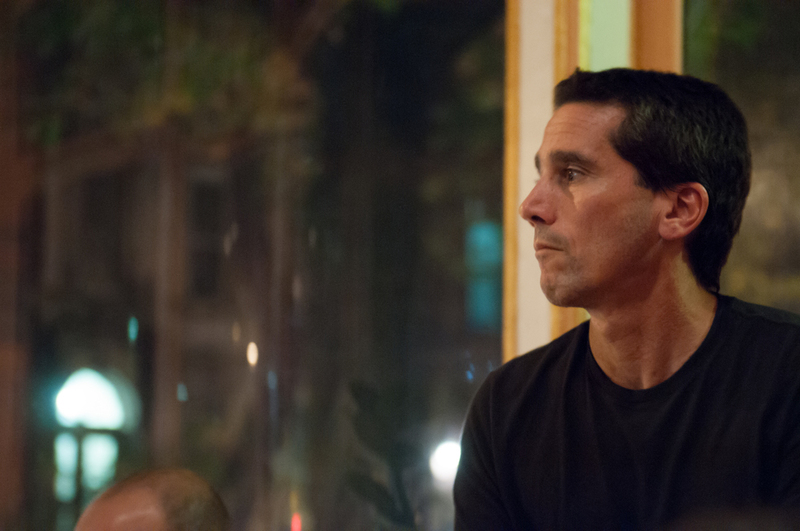 He is the co-founder of the Brooklyn Yoga School where he taught for many years, and is a documentary filmmaker. Jeremy has been deeply involved in music for most of his life, a lifelong guitar player, he attended the Berklee College of Music for his undergraduate degree. In 2007, Jeremy began exploring kirtan after being introduced to Bhakti Yoga in his first 200 Hour teacher training, and it has been a core aspect of his practice since that time. He has been leading kirtan around the NYC area since 2008 and regularly leads kirtan on Friday evenings at Brooklyn Yoga School. In 2012, he recorded Kirtan! 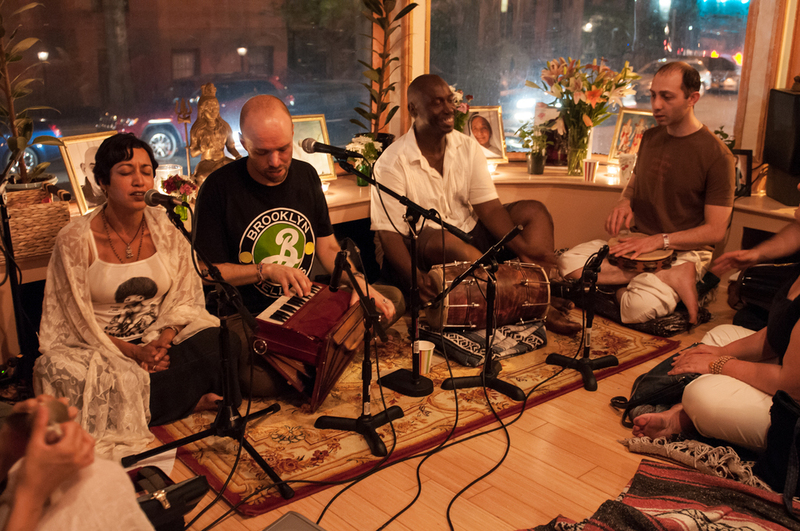 Live From Brooklyn Yoga School with the entire Vanaras family, released in 2014. Lily Cushman is a longtime lover of music in many forms. She began studying voice at the age of 10, eventually leading her to the Berklee College of Music, where she received her undergraduate degree in 2001. For many years following, Lily made music in the clubs of the Lower East Side of NYC, while working in the music industry as an independent audio engineer and producer. In 2007, Lily took a hiatus from the music world to study yoga full-time, and soon thereafter discovered kirtan, also known as call & response chanting. 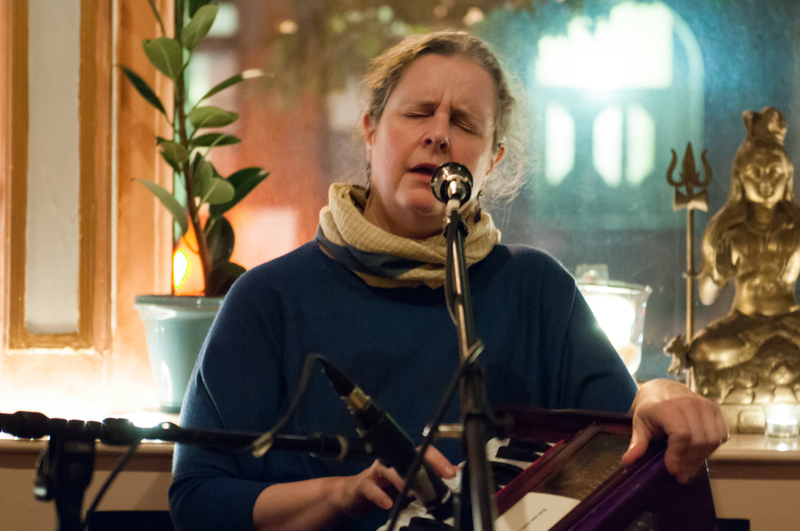 It has since become a core part of her practice, and in 2008 she began regularly leading kirtan in the New York area. In 2010, Lily co-founded the Brooklyn Yoga School, a donation-based studio in Park Slope, which is home to a vibrant chanting community with it's now famous Friday night kirtans. In 2012, she produced a live album, "Kirtan! 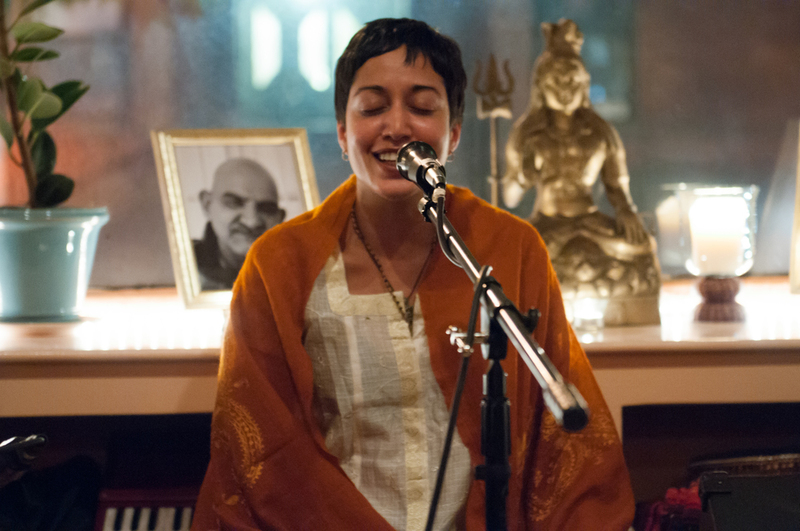 Live From Brooklyn Yoga School," as the first release of her record imprint: Vanaras Music. Lily is currently finishing the production of the kirtan album, "Mother's Calling" by Ambika Cooper, with plans to begin recording her own full length kirtan album upon it's completion. Shyama Chapin has spent many years as a performing songwriter in New England and California. These days she loves most of all to chant the Divine Names and feels lucky and blessed to be able to center her days around this subtle and profound practice. She leads kirtan in New York City—her childhood hometown—and beyond, has been singing in Krishna Das’ Posse, live and on his recordings, for many years, and is featured in response vocals on a number of other chant recordings, including Diana Roger’s kirtan CD, Love Reigns. 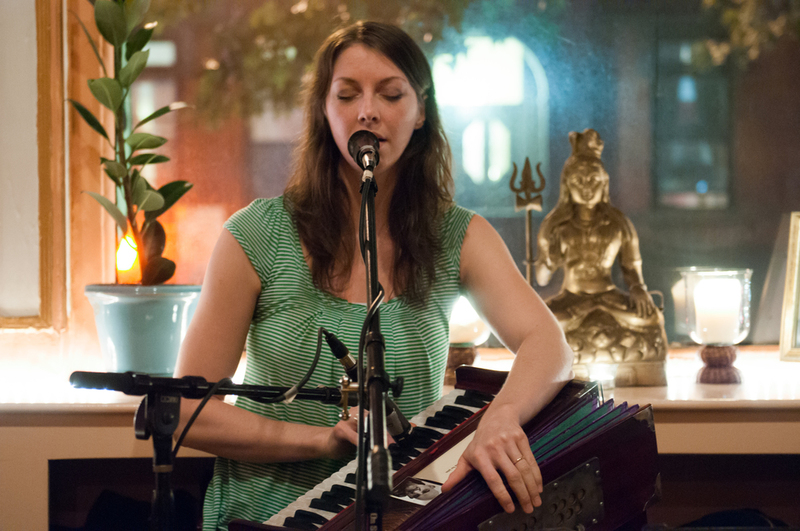 Alongside her own kirtan schedule, Shyama teaches harmonium to accompany chant practice and community kirtan to students in the New York metropolitan area. Her CD of original music, Road Songs, produced in 2003 by Bonnie Hayes, is available online. In 2016, Shyama began recording a double CD of chant music, Love's Door, set for release by Vanaras Music in early 2017. Support the completion of the album HERE.